CINCINNATI -- The Cincinnati Reds are off to their worst start in franchise history through 23 games, and the weather conditions at Great American Ball Park have been dreary, wet and cold. But despite the team’s 5-18 record and a managerial change in the first month of the season, the Reds’ marketing and promotion efforts will stay the course. Whether it's expanding the club’s presence in the community, creating a memorable ballpark experience for families or being the weekend destination for millennials and city residents, there is no Plan B. Even after three straight 90-plus-loss seasons. While few could have predicted eight straight losses and the firing of manager Bryan Price within the first three weeks of the season, the Reds knew coming into this year that their rebuilding process was not over and that the organization would have to prepare for another challenging season for ticket sales. Forgus, who started with the club in 2006, has been through this before. But in this era when competition for entertainment dollars is fierce, filling Great American Ball Park is no simple task, even when the team is good. To that end, the Reds started something new this season with 13 home games starting at 6:40 p.m., 30 minutes earlier than usual in April and September when school is in session. The idea is to start and finish games earlier in the evening, kind of the Reds’ own pace-of-play initiative. The thought is to lure Downtown workers and fans with kids, with the understanding that an earlier first pitch also creates challenges for television viewership and for fans traveling from the far suburbs or regionally. The Reds’ first scheduled 6:40 p.m. game on April 3 against the Cubs was postponed. The others drew 11,128, 19,561 and 9,463. The Reds scheduled two more 6:40 p.m. starts this week, with seven more in September. Several MLB teams are attempting early starts this season, including the New York Yankees, Colorado Rockies, Arizona Diamondbacks, Milwaukee Brewers and Cleveland Indians. Most of the Diamondbacks’ home games are starting at 6:40 p.m. local time this season. The Rockies have a handful of 6:10 p.m. starts at Coors Field. Forgus believes social media makes it easier to stray from the norm and have varying start times. That said, baseball players are creatures of habit with scripted pregame routines. So, they can’t take a game’s start time for granted these days. Some teams call it an “experiment,” while others have tried it and failed. But in the never-ending quest to make it easier for fans to attend games and bolster attendance, the days of the standard 7:10 p.m. first pitch during the week might have gone the way of two-hour games. 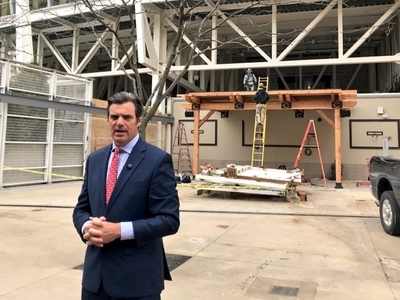 Since the mid-2000s, Forgus and team president and chief operating officer Phil Castellini have left few stones unturned to get people down to 100 Joe Nuxhall Way. The Reds have made fan engagement a priority, with the understanding that many fans demand a winning team and that’s reflected in how their money is spent. Reds attendance has declined the past two seasons since they drew more than 2.4 million fans in 2015. Attendance dipped to 1,836,917 last year, the lowest total since 2009. Attendance has dipped in many MLB cities. The Oakland A’s went as far as to distribute free tickets to fans earlier this month when they commemorated the anniversary of their first game in Oakland. A crowd of 46,028 showed up, about 2,000 shy of capacity. The Reds aren’t going to offer free tickets yet. But for the second straight season they did launch the “Top 6” ballpark pass – in honor of the popular top six rows at Riverfront Stadium – which allows fans to attend all 2018 home games for $29.99 per month. Overall, the Reds have tried to keep ticket prices low. In March, GOBankingRates.com ranked Great American Ball Park the third-cheapest stadium to see a game in all of baseball by calculating the average of the three cheapest 2018 season-ticket seat options and dividing that number by 81 home games, then multiplying by two attendees and adding the price of parking, food and beverages. It came to $55.17. It takes only a quick glance around Great American Ball Park to see what demographic has become of utmost importance to the Reds from a marketing standpoint, and it’s one that might care less about ticket prices. The Budweiser Bowtie Bar in the right field corner has a new upper deck. There’s the Fioptics District in the upper left field corner. Craft beers abound throughout the park, and there’s plenty of standing room and areas to congregate with a view of the field. This is no accident. Millennials are an important piece of the ticket-buying pie. These fans might pay less attention to the National League Central standings and on-base percentage and more on the social aspects of attending a game. A close relationship between the Reds and the bar owners at The Banks is something Phil Castellini has helped foster. Winning and the weather are the two things that have worked against the Reds this season from a marketing and promotion standpoint. In fact, weather has wreaked havoc throughout baseball in April. The Reds were rained out twice in one homestand for the first time since 1985, when the March 29 Opening Day game against the Nationals and the April 3 game against the Cubs were postponed. Through April 22, there were 27 MLB games postponed. Since the league began tracking such things, the previous high for postponements in March and April was 25 in 2007. Reds players also understand the impact rain has had on fans. When the weather improves, so might the crowds. But everyone within the Reds organization understands the reality of the situation. Forking over hard-earned money for tickets and concessions to watch a team that appears headed toward a fifth straight losing season is a tough sell. That doesn’t mean the Reds will stop trying, though.